This year St George’s Chapel is marking the 400th anniversary of the King James Bible, also known as the Authorised Bible, in a number of ways. – Readings at Evensong during the Lent and Trinity terms will be from the King James Bible. – A lecture by Adam Nicolson, author of Power and Glory: Jacobean England and the Making of the King James Bible will take place in the Chapel on 27 June 2011. For booking details <click here>. – An exhibition of Bibles and other treasures from St George’s Chapel Archives and Chapter Library, accompanied by explanatory boards by the University of Sheffield’s Department of Biblical Studies, will be mounted in the South Quire Aisle from 1 April to 2 October 2011. The exhibition will be open during Chapel visitor hours (Monday-Saturday 10am-4pm); Windsor Castle admission rates apply. Please check the diary for any closures. – Lent talks, each with some connection to the King James Bible, will take place on Wednesdays 16, 23 and 30 March and 6 and 13 April. Compline, which will immediately precede each talk, begins at 8pm. 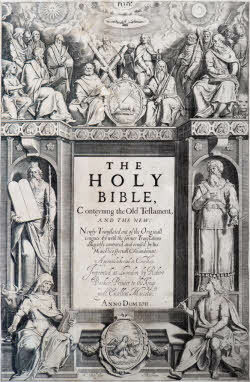 We hope that you will join us in celebrating the publication in 1611 of this much loved and influential version of the Holy Bible, and in commemorating its local connections; the Dean of Windsor, Giles Tomson, was one of its translators, and its official printer, Robert Barker, was a resident of nearby Datchet. The images on the homepage show the Giles Tomson memorial in the Bray chantry and the Barker Bible. The image below is the frontispiece from the Barker Bible.